Researchers have discovered a gene – HMGA2 – that affects the variation in beak size in Darwin’s finches. The team, led by Leif Andersson, a professor at Texas A&M University’s College of Veterinary Medicine & Biomedical Sciences and at Uppsala University in Sweden, recently published their study in the journal Science. Previously, the team discovered that the ALX1 gene affects beak shape, specifically whether the beak is pointed or blunt. Both studies help unveil the genetic basis of the beak variation in Darwin’s finches and further explain this iconic example of evolutionary adaptation. 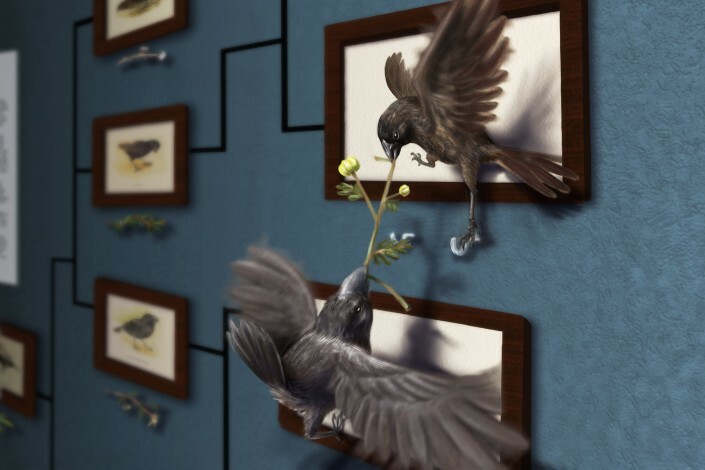 Darwin’s finches greatly influenced Charles Darwin’s theory of evolution through natural selection. The finches descended from a common ancestor, which arrived in the Galápagos Islands about two million years ago. Since then, the finches have evolved into 18 species, differing in body size, beak shape, song, and feeding behavior. Variations in beak size and shape allow the different species to consume different foods, such as insects, seeds, and nectar. Specifically, the researchers compared the medium ground finch and the large ground finch on Daphne Major Island in the Galápagos. The average beak size in the medium ground finch was reduced following a drought because birds with a large beak could not compete well with the large ground finch. Having different beak sizes allowed the two species to use different food sources, reducing competition for a single food source. The team demonstrated that the HGMA2 gene played a prominent role in this rapid evolution. The HMGA2 gene is known to play a role in body size in dogs and horses as well as height in humans.